Infinite Thought set the old men straight when she appeared on the Beckett Post War panel at the Barbican on Saturday, as part of the celebrations of Beckett's centenary. The problem lay in the staleness of the set-up, which contextualized Beckett in terms of 'existentialism', as if not only had the last forty years of Beckett reception in philosophy - Deleuze, Derrida, Blanchot, Badiou - not happened, but also that existentialism could still be understood in the same way that it was half a century ago. Thankfully, I.T. was there to correct both these misapprehensions. The other panelists insisted on seeing Beckett in the terms that had been established in the 1950s. Ken Gemes argued that Beckett's work was a literary expression of the death of God. Jonathan Rée, who admitted he had little to say about Beckett, proved the point by persistently talking about Sartre. From the audience, Beckett's long-time publisher John Calder insisted that Beckett was a lapsed Christian turned Schopenhauerian. What is new about Beckett is that his work presupposes rather than thematizes the death of God. This is effectuated in large part through his formal inventiveness, which destroys meaning rather than represents or describes such a destruction. There is no doubt a element of Schopenhauer in Beckett's work - but it is Schopenhauer after Cantor and Freud. Gemes captured the originality of Schopenhauer's pessimism very well when he said that there had been pessimists prior to Schopenhauer who had proclaimed that life was bad, but Schopenhauer had shown why life must always be bad - because of the will's perpetual dissatisfaction with any of the objects it pursues. Freud famously read Schopenhauer for the first time while preparing Beyond the Pleasure Principle but is worth reflecting on how Freud's formulation exceeds Schopenhauer's. With Freud, it is no longer a matter of 'will' or life as it was with Schopenhauer, but of a death drive, an infinitely plasticized, artificial drive which bears no relationship to the cyclicity of nature. The fact that we are possessed, indeed animated, by this undead impulse, means that however much we may wish to give up, something keeps dragging us forward. The Unnamable's famous 'I'll go on' is not a statement of organic persistence but the voice of the inorganic todestrieb. In Beckett, pessimism might be earnestly hoped for, but it cannot be achieved. Not because of some phenomenological core of irrepressible vitality but because of the remorseless insatiability of the death drive, that excess, that 'more', which constitutively obstructs any possibility of achieving the quiescence of nirvana. Things could always get worse, but that is very far from being comforting, since we're always heading towards the worst - worstward ho! - but we shall never attain it. Beckett's figures - a much more appropriate word than 'characters' for these ventriloquist's dummies, these linguistic marionettes - seem to subsist on the transfinite plane of Cantorian continuum, which even an omniscient being could not know or exhaustively count. Is it not that God has departed, or died - it's worse than that: even if God were around, it wouldn't help. But Beckett was well aware that human beings were inhabited by another inhuman structure, in addition to the death drive: the ceaseless jabber of language. A jabber which is a constant reminder that, much as we might want to be, we can never be alone. Language is itself an Other, and because it is always addressed to Others, or at least presupposes an abstract Other, the ineluctable impulse to write and speak is always snatching the silent serenity of solipsism away from us. The early Watt contains one of the most uproarious sequences in literature, as the hapless lead character, instructed to feed a dog any leftovers, permutates, on page after pedantic page, all the possible ways he might satisfy this demand in the lack of a dog in the house. By the time of his late work, of course, all of Beckett's fiction is sucked inside combinatorial matrices of this type; by then, the exuberance of the naturalistic lifeworld, the whole vast panorama of Joycean Europe, has been remorselessly scoured away, and representation has collapsed into abstraction. The methodological principles governing this abstraction are guided by the Cartesian question - how much can be taken away? As I.T. remarked on Saturday, Beckett's interest in tramps was motivated by a philosophical investigation into the limits of the human. The Beckettian 'I' is the Cartesian empty space, that which is left when everything else is subtracted. 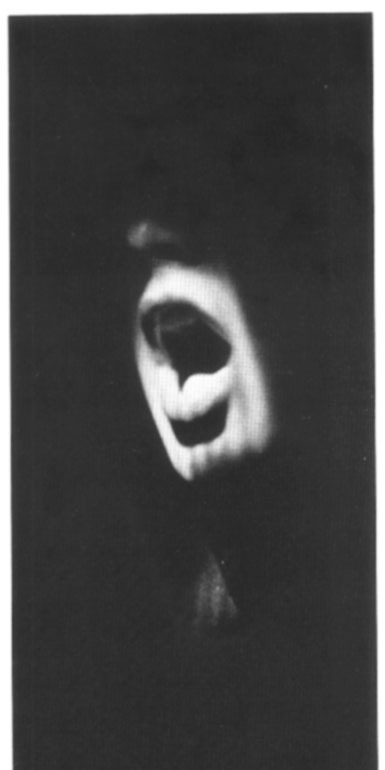 Could it be that the Mouth of Beckett's 'Not I', who recounts a tale, seemingly her own, whilst denying that the story is hers, is not, in fact, in a condition of bad faith, but of Lacanian authenticity, in that she recognizes that no positive predicates, none of the things she is or has done, are ever 'that', what she 'really' is. None of this is 'me', precisely because I am not, this Not is what I am. The combinatorial dimension of Beckett's work was perfectly illustrated by the two late plays, 'Rockaby' and 'Ohio Impromptu', which followed the panel discussion on Saturday. These stark tableaux, where bodies sit in near-catatonic near-stillness while sparse, recited text (sometimes spoken by them, sometimes by an offstage voice) is subjected to micro-varied repetition, are closer to installations than to traditional drama. It's as if the plays, their words reassembled and looped according to quasi-serialist principles, have themselves become the recorder on which Krapp played back his tapes. (As I listened to the desolate repetitions of the language on Saturday, I was reminded of Burroughs, another formalist innovator very much influenced by cassette recorders; Beckett famously abominated the cut-up technique, but there's something in the depersonalized mechanism of his later texts which recalls the machinic melancholia you often hear in the cut-up novels.) Or it's as if an abstract painting has come to (bare) life - or, better yet, as if life has been ascetically reduced to the stillness of painting. But not, perhaps, reduced enough in these productions. I had never seen any of the later plays staged before, and their intense physicality - the rigor not quite mortified poses of the bodies, the harshness of the lighting on the faces - cannot even remotely be rendered by reading alone. Here, 'live' theatre regains its power precisely by subtracting the 'living' and the 'theatrical' - the shrill mugging of theatre acting is replaced by the stasis of bodies assuming the unvitality of the catatonic. Yet, as I.T. complained, the actors and the director could not seem to prevent themselves from interpreting Beckett's notoriously precise instructions. (Hence Beckett's famous exasperation with actors.) 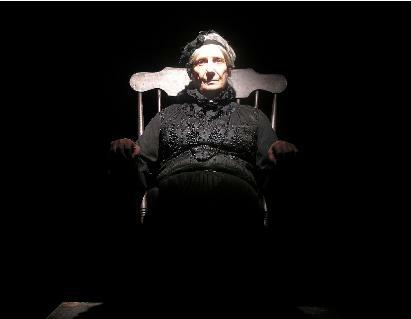 There was altogether too much expression in the way the words were recited; and in 'Rockaby', in an addition to the script which fatally marred the Barbican production, the old woman finally rests her head on one side, as if lapsing into the repose of death, a movement which disastrously shifts away from the play's purgatorial interminability (in which there is always, implicitly, the possibility of something more, worse luck) towards a much less unsettling finality. The productions inevitably prompted the question: can any actor do justice to Beckett's austerity? Is the temptation to expression and interpretation always too much for any actor to resist? What is required is the catatone of a meat puppet, and I wondered if Beckett's scripts hadn't posed a problem that only AI imagineers or CGI animators can solve. Perhaps only an artificial life form can adequately give body and voice to Beckett's human unlife. "seem to subsist on the transfinite plane of Cantorian continuum, which even an omniscient being could not know or exhaustively count"
This attempt to weld D&G "plane"-speaking onto Badiou-style mathematical ontology doesn't work, for two reasons. 1) The fundamental point about Cantor's version of the continuum is that it isn't a "plane", or even a "continuum" for that matter, any more. Cantor abstracts away ALL geometric notions and conceives the continuum as pure cardinality, or pure "quantity" as Badiou puts it. Hence the startling result that the geometric continuum (ie a line stretching to infinity in both directions) is "equivalent" (ie has the same cardinality as) the power set of the naturals (ie the set of sets of whole numbers), despite the utter lack of any "intuitive" (ie imaginary) resemblance between these two multiplicities. 2) The epistomological uncanniness of the continuum lies in the fact that although we can demonstrate (given the axiom of choice) that the continuum HAS a cardinality, we cannot demonstrate WHAT that cardinality is (we have to decide it). The "working mathematician" typically domesticates this uncanniness precisely by invoking the comforting notion of a god that secretly "knows" what the cardinality of the continuum is. This is a standard trop (sometimes "secularised" in talk of a meta-language) of the platonist-realist ideology that Badiou ruthlessly criticises. But Badiou's point is that thinking of all this in terms of what an omniscient being could or could not "know" is deeply misleading. The point isn't to counter "only a god can save us" with "even a god can't save us" (which merely extends rather than opposes theological pathos), but to state something far more disturbing - that a god would be in exactly the SAME position that we are, and that consequently all this fuss about unfillable holes in knowledge amounts to nothing more than Feurbachian alienation, projecting onto God the powers that we are unwilling to acknowledge in ourselves.